In the census of 1910, Thomas Jefferson Collins was enumerated as a teenager living with his family in Ray City, GA. He was born July 14, 1894, a son of William A. Collins. 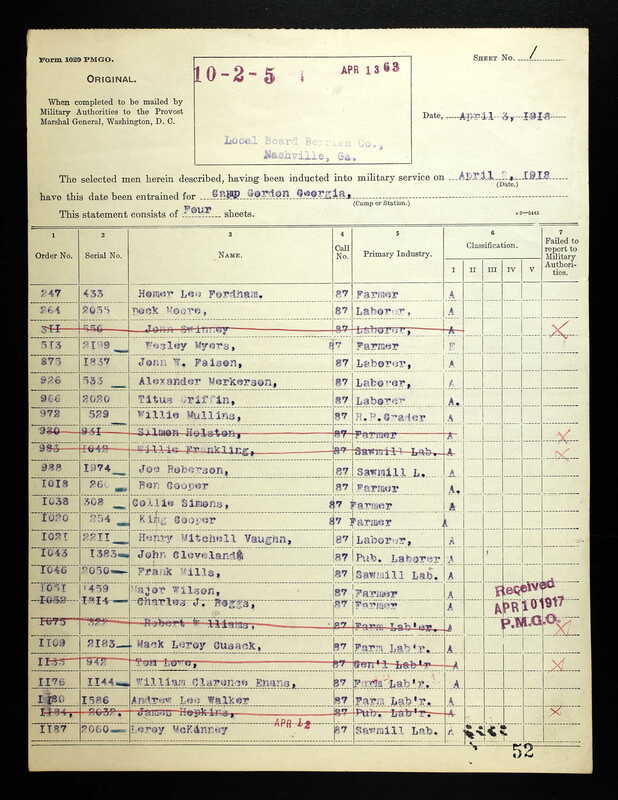 By the time of the WWI replacement draft registration of 1917, he was a young man of 22, with medium height and build, light blue eyes and light brown hair. At the time of the registration, he was living in Barretts, GA, about seven miles south of Ray City where he was employed as a farmer. 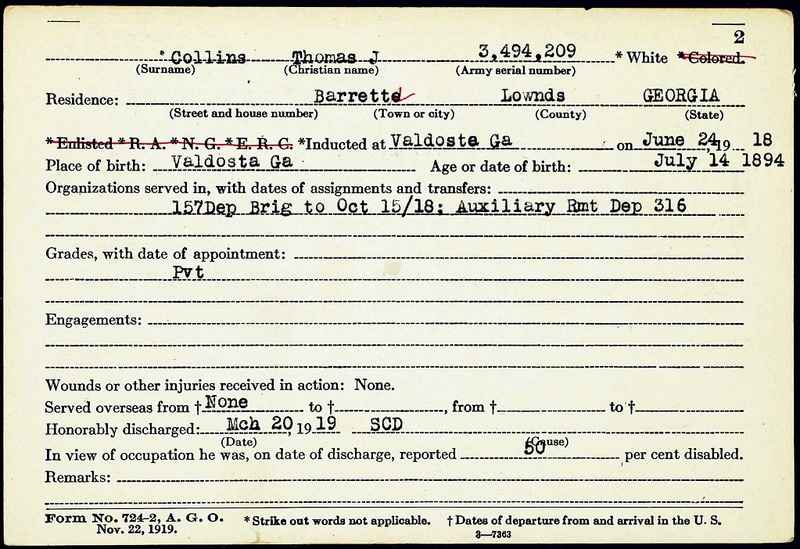 Thomas was drafted and inducted for service on June 24, 1918 at Valdosta, GA. He served in the Army and came back to Ray City a disabled veteran. 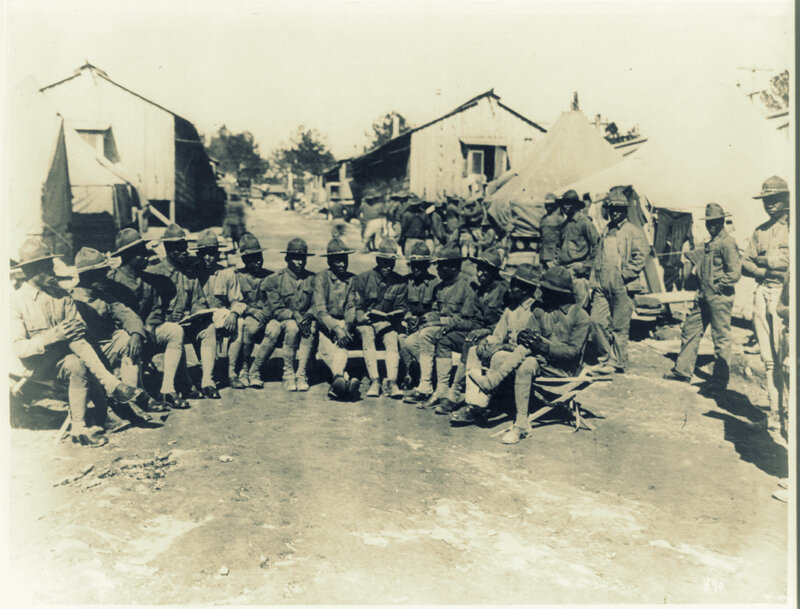 The Army sent Collins to Auxiliary Remount Depot 316 at Camp Gordon, GA. 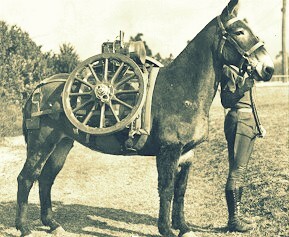 According to the U.S. Army Quartermaster Foundation, “The principle function of the Remount Service during peacetime was to procure, process, train, and issue horses, mules, and dogs (1942-1948) for military use and to train personnel in animal management. Auxiliary Remount Depot No. 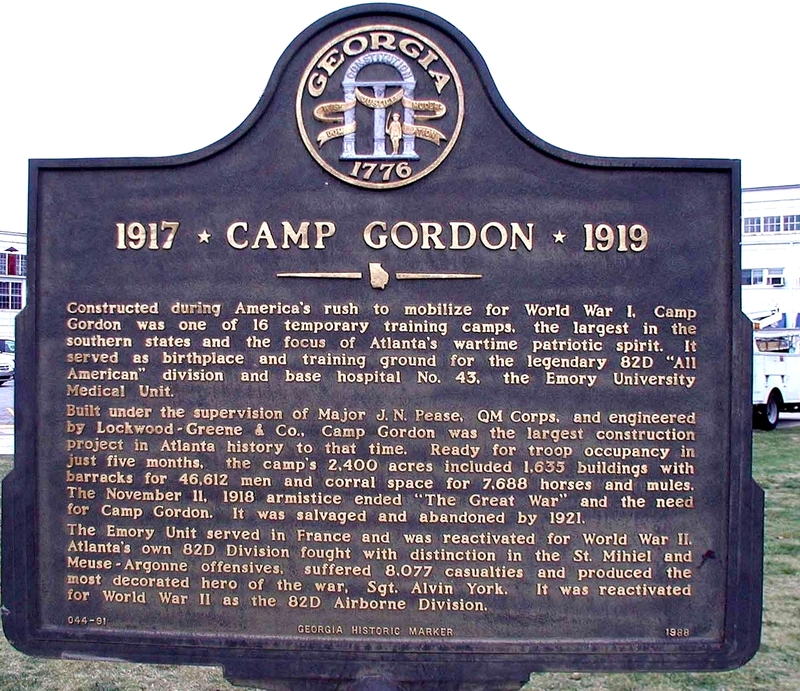 316 at Camp Gordon, GA had a capacity for 5000 horses and mules, and quartered an average of 4015 animals. It was staffed with 6 commissioned officers and 75 enlisted men. Collins served there as a private in the Quartermasters Corps. Listing of other depot staff may be viewed at AUXILIARY REMOUNT DEPOT 316 ROSTER, CAMP GORDON, GEORGIA (ca. 1919). While in Army service Thomas J. Collins was seriously injured resulting in a 50 percent disability. 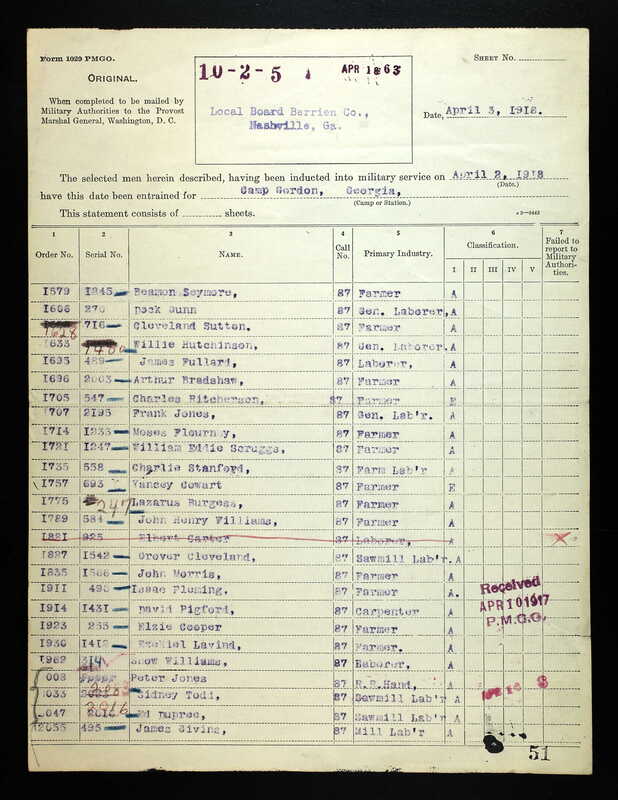 He was honorably discharged on March 20, 1919 with a Service Connected Disability. Fortunately, in 1919 Congress passed a law providing vocational rehabilitation for disabled veterans. During the summer  the bill introduced into Congress by Senator Hoke Smith and Representative Wm. J. Sears, known as the Smith-Sears Bill, was passed by Congress. This Act provides for vocational rehabilitation and return to civil employment of disabled persons discharged from the military and naval forces of the United States. The bill vests the Federal Board for Vocational Education with power to pass on who may be vocationally rehabilitated, to prescribe and provide courses of vocational rehabilitation, and to provide for the placement of rehabilitated persons in suitable and gainful occupations. The bill appropriates $1,800,000 for buildings and equipment ; preparation and salaries of instructors and supervisors; traveling expenses of disabled persons in connection with training; tuition, placement and supervision after placement of vocationally rehabilitated persons; and investigations and administrative expenses. An investigation that has been made by the Federal Vocational Board shows that for every million men in the army 100,000 wounded men will recover. Of this 100,000 men 80,000 will need no re-education; 10,000 should have partial re-education, and 10,000 total re-education. Georgia has about of the population of the United States, and calculating on the basis of three million men in the army we would probably have about 1,000 white soldiers in Georgia to be given re-education, owing to severe wounds. The Federal Board has divided the forms of education for these men into six groups—Agriculture, Commerce, and Professional, Navy, trades, and industries. This action on the part of the government is indeed a noble one. An effort will be made, as in other countries, to put the crippled soldier on an independent basis of wage earning and not leave him to eke out his existence as a cripple or in a soldiers’ home, but let him feel that tho a crippled he can be a useful and self supporting citizen. In 1919-1920 Thomas J. Collins of Ray City, GA was a “Rehabilitation Student” at the University of Georgia. These courses are open only to disabled soldiers, sailors and marines who have been recommended by the Federal Board for Vocational Training. Special courses are arranged according to the previous education and training of those recommended for vocational training, taking these courses are required to take work in English and mathematics and optional courses in general agriculture or special courses in agronomy, horticulture, animal husbandry, agricultural engineering or poultry husbandry. By 1930, Thomas J. Collins was living in Valdosta, GA and later moved to Hillsborough, Florida. Photos of fallen soldiers from the Georgia State Memorial Book, 1921, provide better images of the sons of Berrien County, GA who served and died during the Great War – WWI. Gordon Williams, image scanned for this post, was one of three men from Ray City, GA who gave their lives in the conflict, the others being Ralph Knight and Shellie Webb. PVT. GORDON WILLIAMS. Ray City, Ga. 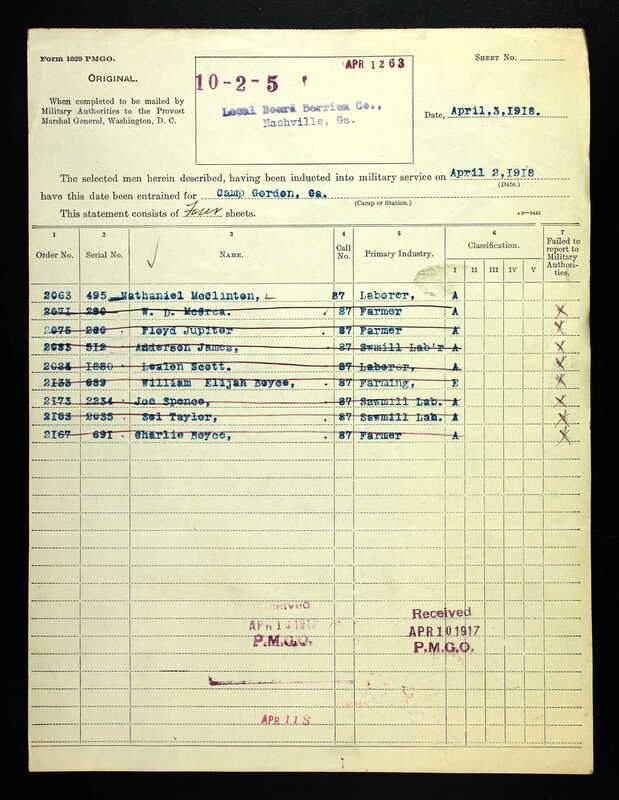 Private Williams entered service June 25th, 1918. Was attached to the 35th Company, 9th Training Battalion, 157th Depot Brigade at Camp Gordon, Atlanta, Ga. Embarked for over-seas in August, 1918, where he contracted pneumonia which resulted in his death at Base Hospital 33, September 20th, 1918. Gordon Williams registered for the draft in Ray City, GA on June 5, 1917. The registrar was C.O. Terry. 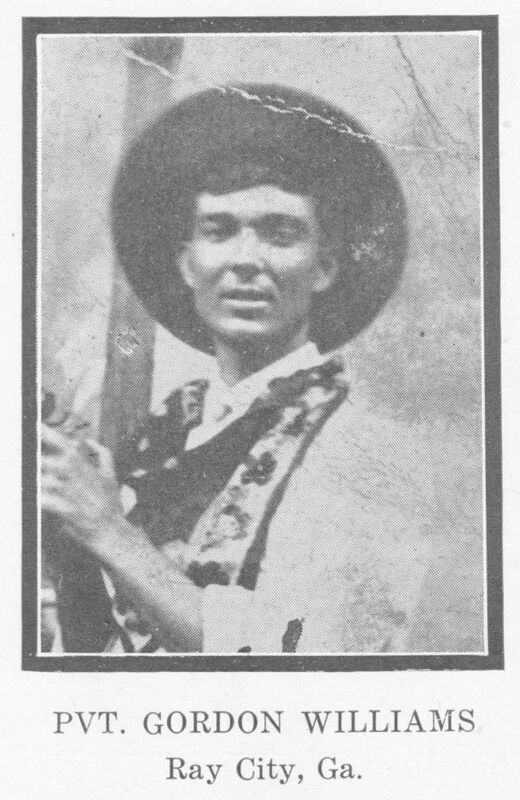 Gordon Williams was selected for service and inducted into the Army on June 25, 1918. He was entrained for Camp Gordon along with 22 other Berrien County men, where he completed his training. Gordon Williams’ fellow Berrien County inductees and camp mates at Camp Gordon included Owen Spivey, J. Falson Brown,Hugh Hardy, Bill Sapp, Silas Isbon Thomas, William Jesse Moore,Isom Thornton, Vaden Hughes, Flem Mitchell Gray, Melton Jackson Hinton, William E. Griffin, Archie Dunn, Luther Tyson, James Fletcher Hutto, Charlie Lawson Sirmans, Thomas Alvin Baker, Brooker Hodges, Robert C. Royals, Zollie Brown Thomas, Billie Lindsey, John Richmond Griner and Milburn Mathis. Panoramic View of Camp Gordon, Atlanta GA, 1918. Gordon Williams and other men Berrien County, GA trained at Camp Gordon. Library of Congress. 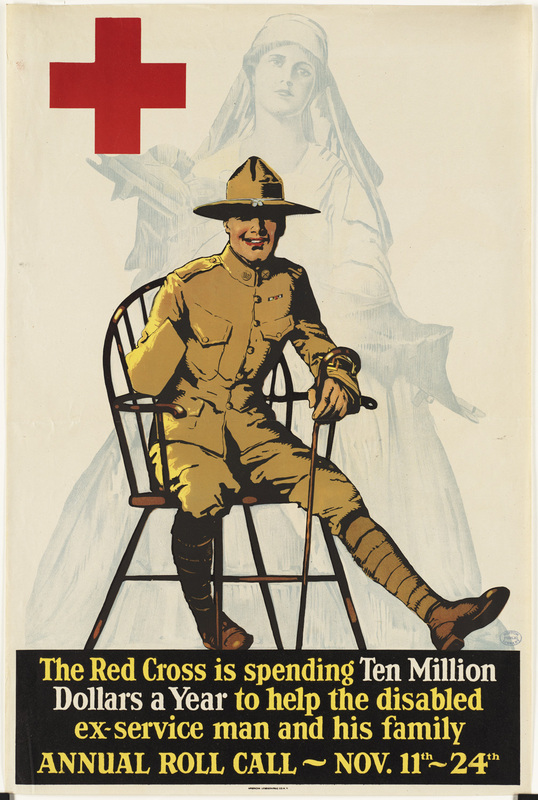 In June, July and August, 1918, the troop ships transported 870,988 American soldiers to Europe to fight in WWI. A large portion of these arriving troops, including Private Gordon, were routed through England. Even before leaving America, these troops were fighting a war of attrition – a war against disease. On some arriving transports, disease ravaged the troops. Thousands of soldiers reached England already stricken with Influenza. Private Gordon Williams was sent to Base Hospital 33 with pneumonia, a frequent complication of Influenza during WWI. He died at the hospital on September 20, 1918. United States Army Base Hospital No. 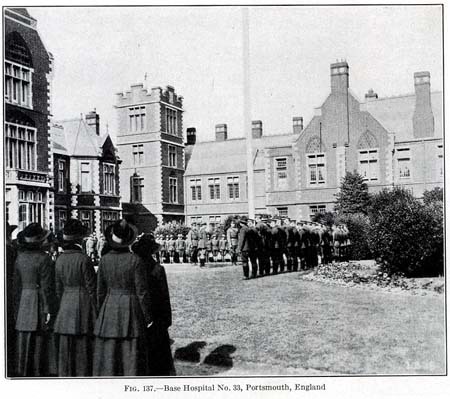 33, established at Portsmouth Borough Asylum, Portsmouth, England, was one of many hospitals where the American casualties of WWI were treated. This institution had been built and maintained by the Board of Asylum Control of London. It consisted of one main building of modern brick and stone construction and of several detached villas surrounded by eight acres of farmland. War wounded requiring surgery were returned from France to Southampton, England on hospital ships then sent on to the base hospitals via motor ambulances and hospital trains; casualties from the front might reach Base Hospital 33 within thirty-six hours from the time they had been wounded. It is difficult to appreciate the extent to which Influenza and other diseases depleted the roles of the arriving American troops. Just two days after the death of Gordon Williams, Base Hospital 33 received word that another troop ship, “the S.S. Olympic, with six thousand troops on board, the greater number of them suffering from influenza, had come to port in Southampton. [The S.S. Olympic was the sister ship of the ill-fated Titanic.] Sixty-six tents were immediately secured from the British to set up in the court yard of Base Hospital No. 33. Convalescent patients and members of the detachment were immediately transferred to these tents and the wards were cleared for the reception of influenza patients. Within one week seven hundred and ninety-seven cases had come to us, one hundred and forty-four of whom were nurses and female members of the Signal Corps. Both pneumonia and meningitis developed. Base Hospital 33, Portsmouth, England. Private Gordon Williams, of Ray City, GA died at the hospital on September 20, 1918. For three years, the remains of Gordon Williams were interred in England. The Atlanta Constitution reported the return of his body to U.S. soil, Jan 13, 1922. Services were held yesterday over the bodies of eight southern soldiers, including one Atlantan, colored, who lost their lives overseas during the world war. The bodies arrived at 11:30 o’clock at the Terminal station. 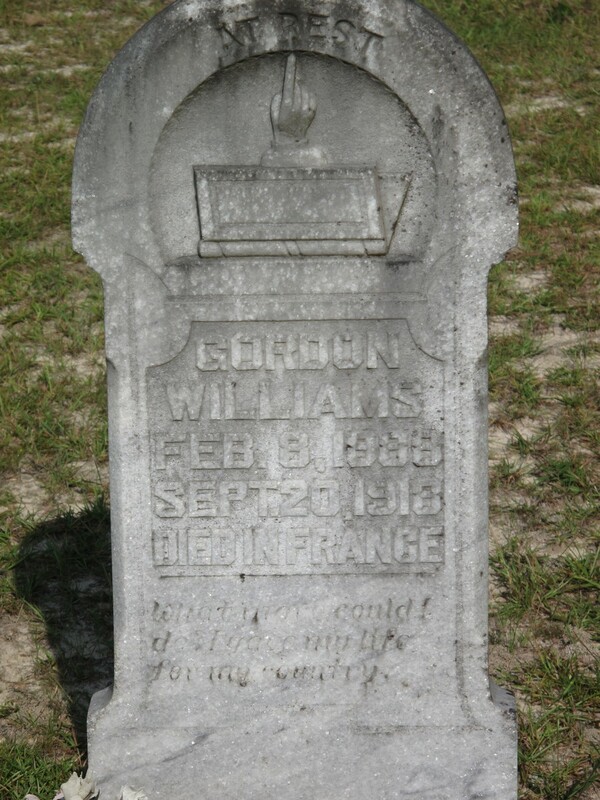 Gordon Williams was re-interred at Mount Pleasant Cemetery, Berrien County, GA.